Completely Light-tight, waterproof and air-tight material. Silver Mylar lined interior for maximum use of light. 600D polyester aluminum coating inside. Mylar Silver, SBS Zips, thick Cloth 100% PVC FREE WILL NOT KILL YOUR PLANTS! Removable water-proof floor tray for spillages. Quick and easy to assemble, lightproof, brilliant silver interior. Adjustable intake and exhaust vents. Military grade zips give full access to the crop. The ideal environment for home cultivation! THE ADVANTAGES OF GROCELL ZELT. The groCELL zelt tents are a God-send for those of us who dont have a greenhouse or grow room. They allow you to grow plants that you otherwise would not be able to, particularly if you live where the grow season is rather short. A good well-made tent will prove to be an inexpensive investment. Cultivate Plants Indoors - With a grow tent, anyone can grow whatever crops they want right inside. People who live in condos or apartments dont usually have the luxury of being able to plant an outside garden. With a grow tent you can grow beautiful healthy plants in any room of your house. By using hydroponic technology, you dont even need to deal with the mess of soil! Great for Beginners For the beginner hydroponic grower, a grow tent provides an excellent option to get started. They are inexpensive, easy to assemble and use and the crop yields will amaze you. Even for experienced hydroponic growers, a tent is an excellent option for expanding your current garden. Expand your Options, Regardless of Where You Live -You are in complete control of the temperature and light level in the tent. This allows you to grow anything you want, regardless of your climate. Plants that normally can only be grown in the south, for example, can be successfully grown anywhere in the world. Save Energy The design of grow tents is extremely efficient and provides optimal conditions for your plants. The interior walls are reflective and fire proof, allowing for maximum light. The walls are well-sealed so no light escapes, making the tent energy efficient and convenient for any room in the house. Light Control Most models come with timers and controls that allow you to tailor the light in the tent to exactly what your crop needs. Different plants have different requirements for optimal growth and being able to control the light intensity and timing in the tent allows you to cater perfectly to your plants needs. Perfect Moisture Control Hydroponic growing is the best way to control water and humidity levels for your plants, and using grow tents makes this even easier. Since the plants grow in water, there is no guesswork involved in making sure your plants are watered properly or that they have enough humidity to thrive. Easy Assembly Most come packaged for quick and easy assembly. Everything you need to set up is included and the instructions make set up a breeze. Depending on the model you choose, some have several shelves that are adjustable and removable so your crop can progress right from propagation to maturity in the same tent. Portability They come in many popular sizes but all are made of lightweight materials that make moving it around very easy if you need to. Even the larger models can be easily taken partially apart to fit through narrow halls or doors and then quickly put back together in its new location. They are very light and can be easily carried from room to room. Grow tents are available in a wide variety of sizes to meet your needs. Whether you just want to start out small with just a few plants or grow an entire crop, you will find a tent that is perfect for your needs. 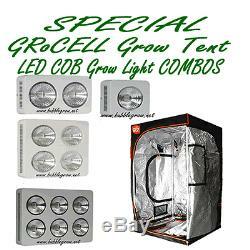 The item "LOW PRICE GROCELL GROW TENT& LED COB GROW LIGHT SPECIALS HYDROPONIC SYSTEM" is in sale since Friday, December 4, 2015. This item is in the category "Home & Garden\Yard, Garden & Outdoor Living\Gardening Supplies\Hydroponics & Seed Starting\Hydroponic Systems". The seller is "bubblegrow" and is located in Carina, Queensland. This item can be shipped worldwide.